Received June 21, 1999; accepted after revision February 10, 2000.From the Department of Radiology, Emory University Hospital, Atlanta, GA.
Summary: A three-dimensional Guglielmi detachable coil (3D-GDC) has been developed that is designed specifically to bridge the neck of an aneurysm with coil loops, thereby facilitating retention of additional coils placed within the aneurysm. Nine wide-necked cerebral aneurysms were successfully embolized using the 3D-GDC, provided that the dome-to-neck ratio was 1.5 or greater. A principal disadvantage of embolization of cerebral aneurysms with Guglielmi detachable coils (GDCs, Target Therapeutics/Boston Scientific Corp, Natick, MA) as compared with surgical clipping is that embolization does not work well for aneurysms that have a wide neck. Complete aneurysmal thrombosis can be achieved in 85% of aneurysms with a neck smaller than 4 mm, but in only 15% of aneurysms with a neck of 4 mm or greater (1). New adjunctive techniques, such as balloon remodeling (2), can increase the rate of successful embolization but incur the cost of increased risk and complexity associated with an additional catheter system. A three-dimensional GDC (3D-GDC) has been developed (Target Therapeutics/Boston Scientific) that is designed specifically to bridge the neck of an aneurysm with coil loops, thereby facilitating retention of additional coils placed within the aneurysm. We report our experience with embolization of nine cerebral aneurysms by use of 3D-GDCs with a spherical configuration. The 3D-GDC is constructed such that large and small loops alternate at 90° angles, creating a complex, 3D coil shape (Fig 1). The 3D coil was used as a first coil in the embolization of cerebral aneurysms in an attempt to form a basket, with coil loops bridging the aneurysm neck into which additional standard GDCs could be deposited. A total of nine embolization procedures were performed with the 3D-GDC. Nine consecutive aneurysms with a neck width of 5 mm or greater were treated. All embolization procedures were performed with the patients under general anesthesia. The ages of the patients ranged from 45 to 87 years. The aneurysms embolized were as follows: one 8-mm- and one 6-mm-diameter anterior communicating artery aneurysm, two 8-mm- and one 12-mm-diameter ophthalmic artery aneurysms, one 14-mm- and one 13-mm-diameter posterior communicating artery aneurysm, one 8-mm-diameter basilar tip aneurysm (Fig 2), and one 6-mm-diameter mid-basilar artery aneurysm. All the aneurysms had a wide neck (5 mm or greater; range, 5.0 to 6.5 mm). Six aneurysms were ruptured and three were unruptured. Angiograms in a 49-year-old woman with basilar tip aneurysm treated by embolization with a 3D-GDC. A, Anteroposterior projection shows wide-necked basilar tip aneurysm. B, Lateral projection shows basilar tip aneurysm. C, Anteroposterior projection after deployment of 3D 8-mm × 25-cm GDC shows no significant extension of coil loops into parent artery. D, Lateral projection after deployment of the 3D-GDC. E, Angiogram after placement of eight additional GDCs shows complete packing of aneurysm. Complete embolization was determined on a subjective basis by consensus of two of three interventional neuroradiologists. The observers were not blinded to the use of 3D coils. Complete embolization of the aneurysm was achieved in seven of nine cases, with no significant parent artery compromise. 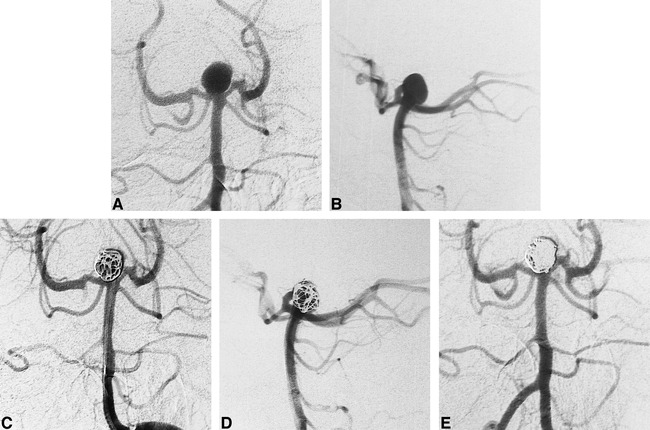 In these seven cases, additional coils were then placed in the aneurysm to achieve complete aneurysmal packing. The dome-to-neck ratio in the seven cases successfully embolized with the 3D-GDC ranged from 1.1 to 2.2 (mean, 1.9). In one of the cases successfully embolized with the 3D-GDC, the aneurysm had a long, tapered neck segment, giving it the appearance of a light bulb. Because of this shape, the 3D coil was constrained and could not adopt its 3D memory configuration. The large loops deployed in the aneurysm fundus and the small loops deployed in the long neck segment provided an excellent basket for placement of additional coils. In the remaining six cases of successful 3D-GDC deposition, the aneurysms had a rather spherical shape, which allowed the coil to assume its 3D memory configuration (Fig 2). When the coil assumed this 3D configuration, loops of the coil bridged the aneurysm neck. The 3D-GDC had a tendency to move in a tumbling manner as it was being deposited into a spherical aneurysm. Because of this tumbling action, which occurred with progressive deposition, it was not possible to predict the final position of any of the coil loops until the entire GDC was deposited. In fact, unsatisfactory deposition into the parent artery was sometimes observed after partial deployment, which was corrected by further deployment. In two cases, it was not possible to deploy the 3D coil without parent vessel compromise because the aneurysm neck was too wide (Fig 3). The dome-to-neck ratio in these two cases was 1.1 and 1.4, respectively. In these two cases, the use of the 3D coil was abandoned and balloon-assisted deposition of a conventional helical GDC was necessary to prevent parent artery compromise. There were no complications related to the use of the 3D-GDC. Angiograms in a 76-year-old woman with ruptured anterior communicating artery aneurysm that could not be embolized with a 3D-GDC. A, Submentovertex projection shows wide-necked anterior communicating artery aneurysm. B, Lateral projection shows anterior communicating artery aneurysm. C, Submentovertex projection angiogram after placement of a 3D 6-mm × 15-cm GDC shows extension of coil loops into parent artery. The coil was not detached. The size of the aneurysm neck has been found to correlate well with treatment success and can therefore be useful in selecting patients for coil embolization with standard GDCs. Complete aneurysmal thrombosis can be achieved in 85% of aneurysms with a neck less than 4 mm, but in only 15% of aneurysms with a neck 4 mm or greater (1). Recently, Hope et al (3) reported treatment success in 83% of aneurysms with a neck of 4 mm or less and in 55% of aneurysms with a neck greater than 4 mm. Debrun et al (4) noted that with a dome-to-neck ratio of at least 2.0, the occlusion rate was 77%, whereas the occlusion rate was only 53% if the dome-to-neck ratio was less than 2.0. Balloon assistance may be necessary if the aneurysm neck is wide, and this practice may increase the rate of successful embolization (2). The added risks of the balloon remodeling technique include vessel rupture and thromboembolic complications incurred by adding a second catheter system. Use of a second microcatheter and deployment of two coils simultaneously may facilitate successful coil embolization of a wide-necked aneurysm (5), but this also incurs the additional risk and complexity of a second catheter system. An endovascular stent has been used to bridge the neck of an aneurysm, thereby facilitating coil deposition without parent artery compromise (6). Permanent balloon occlusion of the carotid or vertebral artery may be needed if it is not feasible to preserve the parent vessel with coil embolization or if the aneurysm is too large for complete coil embolization. In the process of GDC embolization of cerebral aneurysms, the first GDC is often the most difficult to deposit and provides the framework for further coil embolization of the aneurysm. A coil of appropriate size should be chosen on the basis of angiographic assessment of the diameter of the aneurysm fundus and neck. The first coil should have a diameter similar to the diameter of the aneurysm fundus and larger than the diameter of the neck. A first coil of appropriate size and softness should form a complex basket into which the subsequent coils can be deposited. It is important that some of the loops of the first coil extend across the neck. Standard GDCs have a helical configuration in their lowest energy state and rely on a rather random combination of forces to generate a complex configuration with loops extending across the aneurysm neck. The principle advantage of the 3D-GDC is that the coil assumes a complex shape with loops extending across the aneurysm neck because of its shape memory for a complex sphere. The 3D-GDC may also reduce the frequency of coil compaction, but this remains to be proved. This series is limited by its small size. With larger series in the future, it may be possible to show a higher technical success rate for coiling wide-necked aneurysms with the 3D-GDC as compared with conventional GDCs. Our initial experience establishes that the 3D coil does allow complete treatment of some wide-necked aneurysms without the need for adjunctive techniques. ↵1 Address reprint requests to Harry J. Cloft, MD, PhD, Department of Radiology, Emory University, 1364 Clifton Rd NE, Atlanta, GA 30322.